Responsive design – Gameday adjusts its layout based on the device it is being viewed on. This means the theme’s content will be easy to read and easy to navigate whether it is being viewed on a desktop computer, a tablet or a mobile device. 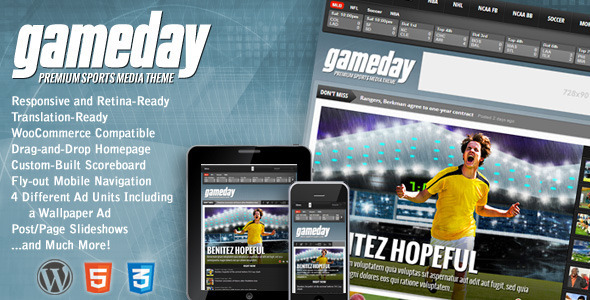 “Sticky” Navigation Bar – Gameday comes with a “sticky” menu bar that will always stay at the top of your device window as you scroll down the page for quick and easy navigation. Logo position in Navigation Bar (Optional) – Gameday gives you the option to either display your logo in the traditional area above the content area or you can place your logo in the “sticky” navigation bar! Slider on category pages – No more boring category pages with a list of the most recent posts. 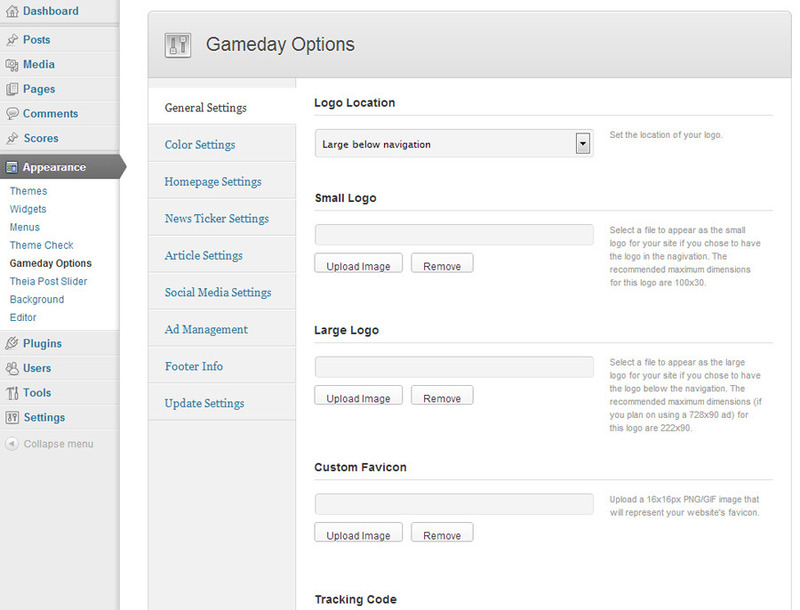 Gameday gives you a slider to display your most recent posts on your category pages! 4 different ad units – Gameday takes full advantage of available ad space to give you 4 different ad units, including a rare wallpaper ad! The ad units include a 728×90 ad, a wallpaper ad, in addition to unlimited 300×250 and 125×125 ads (displayed in a widget that holds four 125×125 ads). MVP Themes takes pride in its support! If you have any questions related to the setup of Gameday that are not covered by the theme documentation or if you run into any bugs with the theme, please submit a ticket at the MVP Themes Support Center. Unfortunately, MVP Themes cannot perform customization work for each of our customers, so Gameday comes “as-is”. Any customization you would like to make to the theme outside of fixing bugs will need to be done by you or a third party. Scoreboard items now link to posts for game previews/recaps/game info. Adds “Latest News” page template that displays all posts from site.